Hector Javier Alvarado, 24, was one of three men arrested this week in connection to two bodies found in a burning vehicle in Edcouch in May. Each men were charged with one count of capital murder of multiple people. 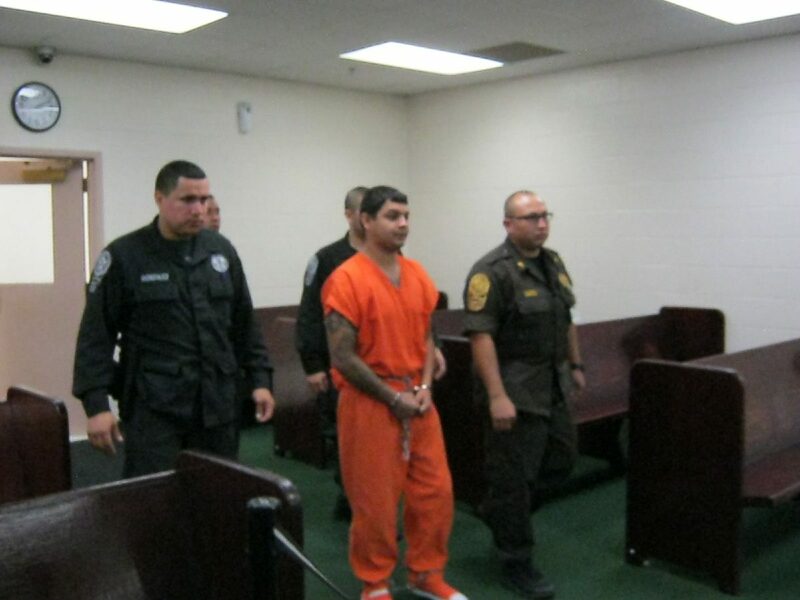 Justice of the Peace Jaime Jerry Munoz set his bond Tuesday at $3 million. EDINBURG — A man on trial for a 2015 double murder will have to wait another month to learn whether a jury will find him guilty in the deaths of two men found in the trunk of a burning car. A judge granted a continuance in Hector Javier Alvarado’s capital murder trial Thursday morning after learning that the state had failed to provide the defense team resumes, summaries of testimony and reports from expert witnesses they intended to call to the stand to testify. These witnesses included the forensic pathologist who conducted the autopsies of the victims — 26-year-old Lazaro Alejandro Martinez Esparza and 23-year-old Jose Luis Salinas Torres — as well as a crime lab analyst who conducted DNA testing among others. This revelation came Wednesday, the second day of trial, and left visiting judge Jaime Garza wondering how this had happened, after both sides had announced during pre-trial hearings that discovery was complete and they were ready for trial. Alvarado, 26, is one of three suspects charged with the murder of Martinez Esparza and Salinas Torres, who were fatally shot prior to being stuffed in the trunk of a Volkswagen Jetta that was set on fire May 1, 2015, along a canal bank in Monte Alto. The state alleges the murders occurred as a result of a drug deal gone wrong. Trial dates have yet to be set for the remaining suspects, Edwin Salinas, 25, and Carlos Palacios, 32, who are also charged with capital murder. Garza’s decision to grant the defense’s request for continuance came after he denied their request for a mistrial. “The continuance that the court is suggesting … would require this jury, after being sworn, to be out on the street, and while I can appreciate the court’s instructions I don’t believe the court’s instructions will be sufficient … ,” defense attorney O. Rene Flores argued. While under oath, jurors are instructed by the judge not to discuss or research the case, or read or watch its media coverage. Alvarado’s trial is scheduled to resume June 18. He has elected for the judge to sentence him, and if the jury finds him guilty, he could be sentenced to life in prison.